The PMMWC was designed to see through various types of weather, smoke and dust. 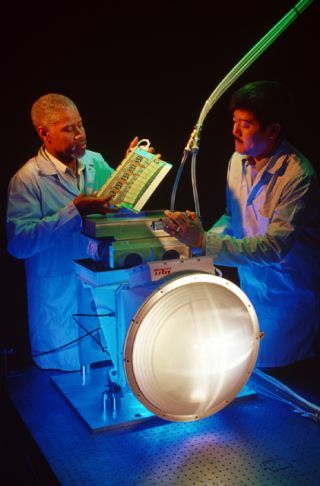 In this historical photo from the U.S. space agency, engineers at TRW, Redondo Beach, California, in May of 1997, inspect the Passive Millimeter Wave Camera, a weather-piercing camera designed to see through fog, clouds, smoke and dust. Operating in the millimeter wave portion of the electromagnetic spectrum, the camera creates visual-like video images of objects, people, runways, obstacles and the horizon. A demonstration camera (shown in photo) has been completed and is scheduled for checkout tests and flight demonstration. Engineer (left) holds a compact, lightweight circuit board containing 40 complete radiometers, including antenna, monolithic millimeter wave integrated circuit (MMIC) receivers and signal processing and readout electronics that forms the basis for the camera's 1040-element focal plane array.